It has been a long wait, but at least we now have official details in regard to the 2015 Cadillac Escalade, as GM has now offered official details on the upcoming SUV. There are said to be a number of improvements in key areas, such as the exterior, interior, overall quality and technology. The new Escalade needed to make a huge leap in terms of technology, and the team behind the SUV has certainly done that. So what does this 4th generation Cadillac Escalade have to offer? 2015 Cadillac Escalade exterior changes — Work has been done to make the exterior more sophisticated, this has been achieved by including LED lighting, doors that now match the style of the exterior design, which helps reduce wind noise. Aerodynamics have been improved thanks to a few clever enhancements, such as active air shutters on the front grille that close as the vehicle gets faster, this reduces drag to improve fuel-efficiency. 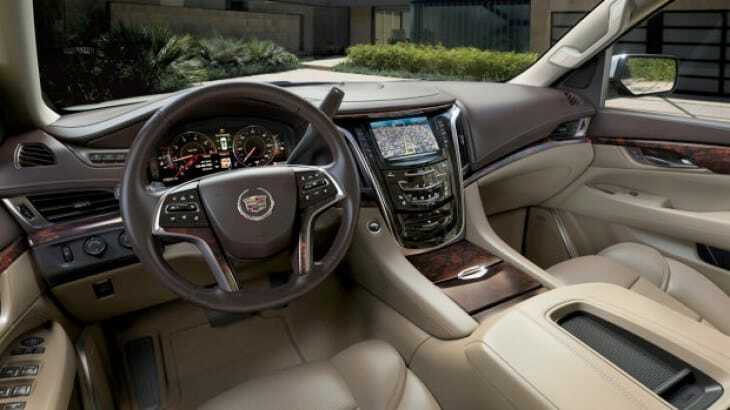 2015 Cadillac Escalade interior changes — The biggest changes are not with the exterior, but the interior. You can clearly see Cadillac has put a lot of effort into the cabin, as this is the place that connects car and driver. Improvements have been made to the materials used, how they have been fitted to the SUV and the final finish of work. Previous versions of the Escalade felt rushed and unfinished, but the new interior tolerances on the door panels and instrument panel are now much tighter — something that is very important when appealing to a more luxury market. To help make the interior feel more up-market there is now ambient lighting and a choice of wood trims. The seats have been designed to sculpt around your body, allowing you to feel at one with the new Escalade. The 2015 Cadillac Escalade driving experience will be a much quieter place thanks to an all-new body structure, acoustic material and more importantly, the new Bose Active Noise Cancellation technology that helps cancel out road noise. For more details visit Cadillac, but we can tell you the 2015 Cadillac Escalade price will be around $64,000 to $87,000 when it is released in spring 2014.